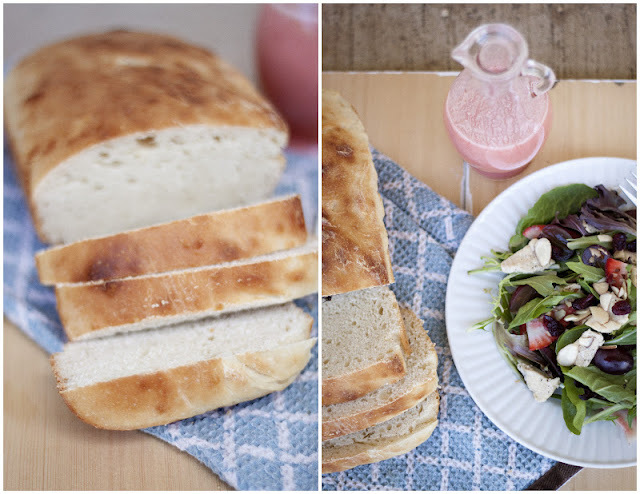 Mustard Me Yellow: Summer Chicken Salad & Homemade Bread. 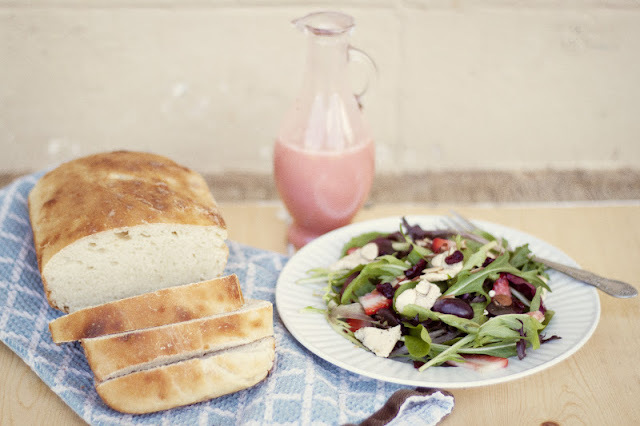 Summer Chicken Salad & Homemade Bread. 1. In a medium sized bowl toss the mixed greens, dressing, and chicken. Transfer into serving bowl. 2. Top salad with dried cranberries, red grapes, and sliced strawberries. 3. Sprinkle chopped cashews on top to finish. 5. In a medium sized container mix the strawberries, salt, sugar and vinegar. Blend well in a blender. 6. While blending slowly add in all the oil, blending until smooth. HOMEMADE BREAD (Recipe from FOOD.COM). 1. Heat milk, sugar, salt, and butter substitute in small saucepan until butter melts and sugar dissolves. 3. Dissolve yeast in warm water in warmed mixer bowl. 4. Add milk mixture and slowly add flour. 5. Mix for 1-2 minutes on speed 2. 6. Place in greased bowl, turning to grease top. 7. Cover and let rise next to warm over for 10 minutes. 8. Put dough in greased loaf pan and leftover dough in greased muffin pans. 9. Let both pans rise in over (170 degrees) for 10 minutes. 10. Bake at 425 degrees (12 minutes for biscuits and 25-30 minutes for bread). wow this looks amazing!! definitely going to try! You should! The salad dressing is to die for.